From buildings to mountains, from smoke to fog, from noise to peace, from traffic jam to adventures, from fast food to delicacies and from emails to real conversations! I’m on the road now traveling up north! I’m excited to see the mountains, feel the cool breeze and listen to the whisper of the wind. And because of this travel and my upcoming travels till next year, I bought new backpack and luggage. Blame it to the past mega-sale! I became hesitant at first if I need to buy those things since I’m really on a tight budget. 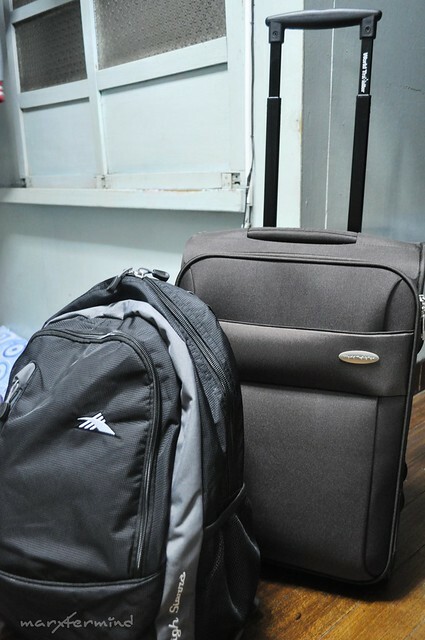 But since I became fond of going to places, having my own travel bag and luggage is really essential. So I bought the items and got excited to use them. I felt like a kid who got a new item to use to! And here are my new travel buddies. Cheers to more adventures, travels and places to explore. Ready to go? So what travel items you have that excites you to use? 'Loved the simply stylish trolley bag. Congrats on your new travel buddies. Apir! Actually, gusto ko na rin magkaroon niyan. My mom used to tell me, dapat yan ang inuna ko bago ako nagsimulang maglakwatsa. Kunsintidora e no. Ibili ko na daw ang sarili ko sa pasko. I'll definitely choose a red luggage. Namiss ko mga blog nyo talaga. hay! I'm back!